Readers of this site might remember my family road trip through West Monroe, LA. last month to visit the Duck Commander compound en route to New Orleans. 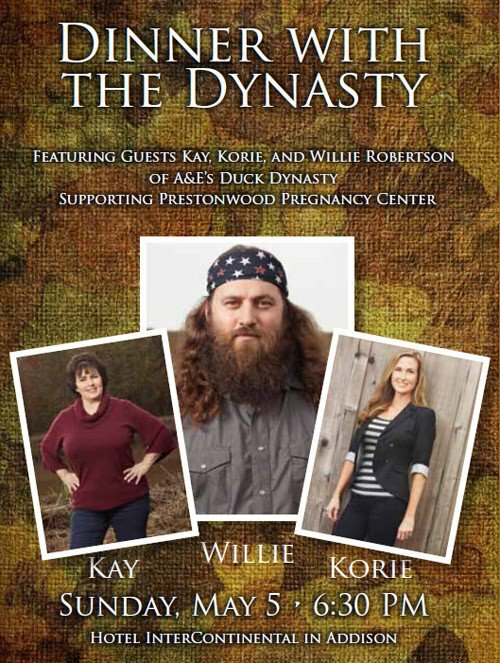 Well, I just found out that I am going to have a “happy, happy, happy” birthday because three members of the Robertson family from the A&E hit reality show Duck Dynasty will take to the stage on May 5 for the annual Prestonwood Pregnancy Center fundraising dinner. “Dinner with the Dynasty,” will feature Kay, matriarch of the family, and Willie, the CEO of Duck Commander, and his wife and business partner, Korie. This is an incredible opportunity to hear personal tales from the Robertsons, support a great organization, and enjoy a delicious meal. (No, duck is not on the menu.) The event will be at the Hotel InterContinental in Addison. Table sponsorships are available and individual seats went on sale Monday, April 15, at a cost of $150 each. Prestonwood Pregnancy Center, a ministry of Prestonwood Baptist Church, celebrates its 22nd anniversary this year. In the past two decades, the center has helped more than 52,000 clients by providing guidance for unplanned pregnancies, pregnancy tests, sonograms, educational classes and post-abortion support groups. Services are provided free of charge. Prestonwood Pregnancy Center is located at 15757 Coit Road #308, in Dallas, but it also serves clients through a Community Mobile Sonogram, which travels to various locations in Dallas County on weekdays. Another Community Mobile Sonogram will begin serving clients in Collin County in the coming weeks. Dinner with the Dynasty will take place on Sunday, May 5, at 6:30 p.m. at the Hotel InterContenental. For reservations or more information, contact hhuber@prestonwood.org or 972-386-4015.